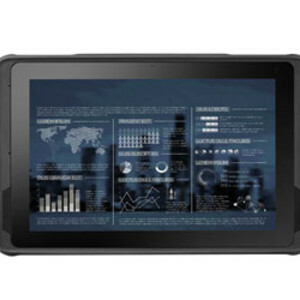 The AIM-68 tablet is powered by an Intel Atom x7-Z8750 processor and offers dual OS support for both Windows10 IoT Enterprise and Android 6.0. The AIM-68 is also equipped with Advantech’s industrial-grade Android OS, which is designed to provide a reliable application framework and user-friendly tool for conducting remote control and diagnostics, enterprise management, OTA programming and module extension operations. With its compact and lightweight design, multiple I/O ports and application-oriented peripherals, the AIM-68 provides the portability and flexibility to satisfy various demands in a wide range of usage scenarios. Features include a 2 MP front camera and 5 MP rear camera with auto-focus, 4 GB of memory, 64 GB of storage and a 10″ WUXGA IPS full HD LCD display with scratch-resistant Corning Gorilla Glass 3 and multitouch PCAP control. The high-brightness display ensures readability in direct sunlight for outdoor applications. With Wi-Fi, Bluetooth, WWAN and NFC wireless communication technologies, the AIM-68 supports real-time data transmissions and GPS tracking, which are essential capabilities for field service operations. Moreover, with its wide operating temperature range (-10 to 50°C) and IP65 rating for protection from dust and water ingress, the AIM-68 has the durability to withstand operation in extreme environments. The battery supports 5–6 h of operation for long-duration use and can be recharged via a docking station. 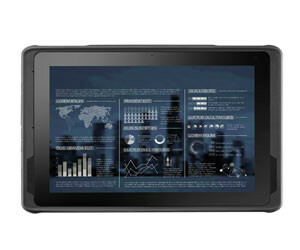 I am interested in Advantech AIM-68 Industrial Tablet with Application-Oriented Peripherals .